:) "Fast" is all a matter of perspective, right? Love the drawing and it makes me laugh. Sort of says 'everything is relative'. Hahahaa! This is gorgeous! Really funny, great drawing! Too funny! I guess "fast" is relative. Spectacular way to spend your meeting day time Brian, yielding spectacular results! What fun! 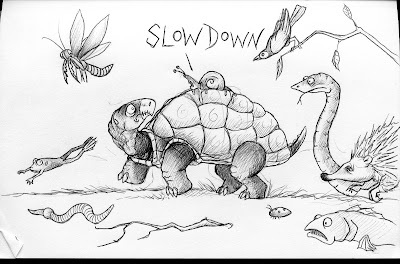 Love the tortoise's expression!! hahaha!! This is so funny and well done!! So creative! Everything depends on the point of view, everything is relative! it's certainly all relative, imagine how a glacier feels!!!!! i like how the two slowest animals carry their home on their back. for some reason it makes me think of old people in RVs on the 99. What a great drawing - and you're right: it puts everything in perspective. That made me laugh out loud which I almost never do especially when I am alone. Great work Brian.